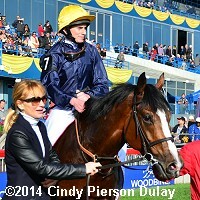 The last Grade 1 races of the Canadian racing season were run at Woodbine on Sunday, highlighted by the 77th renewal of the $1 million Pattison Canadian International (G1), featuring top older horses going 1 1/2 miles, 1 complete lap of the E.P. Taylor Turf Course. 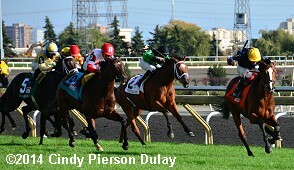 Conditions were typical for late October in Toronto, with partly cloudy skies and temperatures in the high 40's, with the course GoingStick reading of 9.6 (good-to-firm). The originally drawn field of 10 left the paddock and participated in the post parade, but as the field approached the gate, expected favorite Brown Panther bolted away, ran through the gap between the starting gate and the outside rail, dumped jockey Richard Kingscote on the clubhouse turn, continued riderless down the backstretch and around the far turn before being caught by outriders at the 3/16 pole. As a result he was a late scratch by the stewards, leaving 9 to load into the gate with Hillstar the 5-4 favorite off his win in the Legacy Cup (G3) at Newbury. In to challenge him included 5-2 second choice Big Blue Kitten, fourth in the Joe Hirsch Turf Classic (G1) at Belmont, and 6-1 third choice The Pizza Man, fifth in the Northern Dancer (G1) after winning the Stars and Stripes (G3) and American St. Leger at Arlington. Jockey Justin Stein sent 16-1 Reporting Star to the lead and he set fractions of 25.31, 50,34, 1:15.35, and 1:40.10 while stalked by The Pizza Man amd 12-1 War Dancer. Entering the lane, The Pizza Man gained the lead through 1 1/4 miles in 2:04.54. However, at the 1/8 pole The Pizza Man tired as favorite Hillstar, fifth early, took over the lead and held off late-running Big Blue Kitten by 3/4 length for the win in 2:29.00. It was another 2 lengths back to 14-1 Dynamic Sky, who nosed out The Pizza Man in fourth. 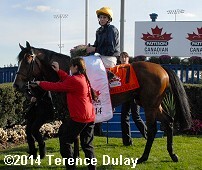 Left: Hillstar in the winner's circle. Winning jockey Ryan Moore said, "I was out a little bit too early but he was fine and plenty and it was going to take a good horse to get by him. Like Brown Panther, (Hillstar) was the best horse in the race and just felt we would keep it as simple as we could. I am sure (trainer Stoute) had this race as a target from a long way out and it was always something we had in the backs of our minds if things were going well. I moved a bit too early today but he was the best horse and we kept it straightforward again. He idled and changed leads 100 yards out." 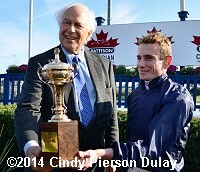 Right: Owner Sir Evelyn de Rothschild and jockey Ryan Moore pose with the trophy. 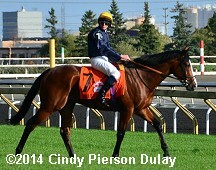 Left: Hillstar behind the starting gate before the race. Moore added, "Coming here we thought we could beat (Brown Panther). He beat us at Chester but there's always a horse race. It was just very sad for the connections. You bring the horse all the way over here and unfortunately something like that happened. Fortunately the horse looks like he's okay though." Owner Sir Evelyn de Rothschild said this was the horse's final start of the year. 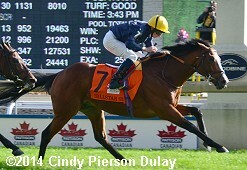 Right: Hillstar returns after the race. 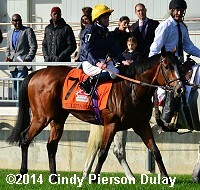 Left: Second place finsher Big Blue Kitten in the paddock before the race. 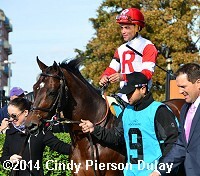 Jockey Joel Rosario said, "I had a good trip. It took him a long time to get into the race, but he ran well. I thought the horse that won the race was the best horse today, and I'm glad we got second." 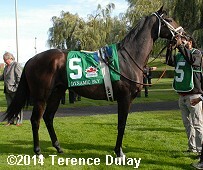 Right: Third place finisher Dynamic Sky in the paddock before the race. The 14-1 shot raced in 6th about 8 lengths off the pace under jockey Patrick Husbands then rallied to get third beaten 2 1/4 lengths. The Mark Casse trainee improved his record to 4 wins, 4 seconds, and 5 thirds in 19 starts, earning $772,840 for owner John Oxley. 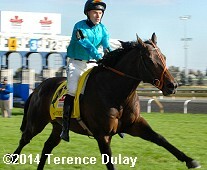 Left: Favorite Brown Panther who was scratched after running off before the start. Jockey Richard Kingscote said, "Just before the break, the horse got wound up and unfortunately he got me off. When I got back on, I tried to keep him relaxed and as soon as I let go he bolted. There wasn't much I could do after that. He's never done that before. He sometimes dances about and gets on his toes, but he's never been that extreme." 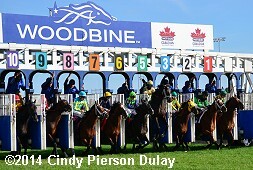 Right: The field breaks from the gate for the 77th running of the Canadian International. You can see Dynamic Sky reared at the start.